If you're into Boxing, CrossFit, MMA, an Athlete or just a beginner and all of you only aim for the best then the ProBox I is the perfect fit for YOU! You see this is not your ordinary Jump rope Set. With our ProBox I, designed in Germany, we merge portability, highest quality and practicality with a beautiful, timeless and fashionable Design. The Jump Rope itself is prove of our commitment to deliver the best equipment in this category. From the AirGo Handles, the SlipLess Straps to the smooth speed Ball Bearing System and the 4 mm thick Polyester Coated Stainless Steel Rope, everything fits perfectly together to deliver the best workout experience. But that's not all. Our BoostPack includes Accessories consisting of helpful tools that are stored in the customized Foam insert inside of the Case. To this day there is no other Jump Rope Set that delivers this kind of experience. Furthermore we pride ourselves on offering superior customer service. Therefore, in case, that for any reason you think it's not right for you, you have 30 days to let us know and we'll give you 100% of your money back -no questions asked. So, join us...there are no more excuses...sign up now. And when you do, consider purchasing two as a gift for your workout buddy! 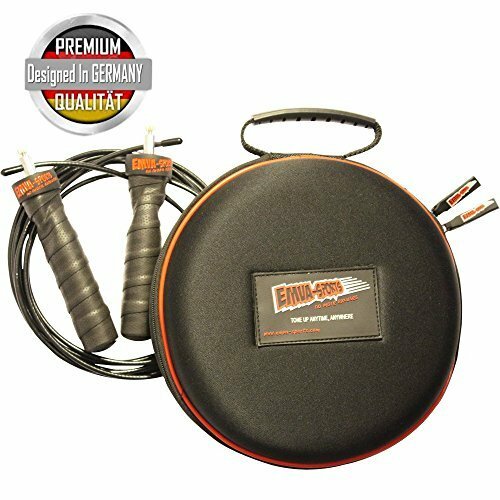 ☛Designed in Germany: Enjoy the Experience of the first available Jump Rope Case High in Quality and Functionality combined with a Fashionable Design. Jealous looks are guaranteed! ☛AirGo Handles: Discover our AirGo-nomically shaped handles that almost merge with your fingers and avoids unnecessary tensions in your hands to keep them relaxed. ☛SlipLess Straps: Never loose grip with our SlipLess Straps and always have a comfortable feel no matter how intense and sweaty your workout gets. ☛Boxing Champion Maricela Cornejo says: ‎"It's awesome...they went beyond what I expected...Literally you get two Jump Ropes in one...I love it!" If you have any questions about this product by EMVA Sports, contact us by completing and submitting the form below. If you are looking for a specif part number, please include it with your message.